Shemot/Exodus 35:10 And let everyone who is wise of heart among you come and let them make everything that the L-rd has commanded. The two adjacent verbs in the middle of the verse are both Qal prefix 3mp forms, using what grammarians call a jussive1 voice or mood, from the very common roots - to come or enter - and - to do or make. Both of the two meanings are blended here for each verb: come and do, come and make, enter and make, enter and do. There is both an active engagement and a constructive activity: coming forward and entering into the work, while the work itself is to be done by making or fabricating. Abravanel comments, "for the work of skilled artisans is also a contribution". Just as you cannot build a Tabernacle without the material "stuff", so a pile of stuff in the desert without anyone to do the assembly is not going anywhere. Both the people and the stuff are needed. Mark relates the people describing Yeshua as, "the carpenter, the son of Mary and brother of James and Joses and Judas and Simon?" (Mark 6:3, ESV) and Matthew adds, "Is not this the carpenter's son? Is not his mother called Mary? And are not his brothers James and Joseph and Simon and Judas?" (Matthew 13:55, ESV). While there is some argument about the precise meaning of the Greek word , translated in both cases by the ESV as the traditional 'carpenter'2, it is clear that Yeshua (and his earthly father, Joseph) was clearly recognised as an artisan. His hands would have shown scars of splinters, chipped nails and rough skin from years of rough work - often outside in all weathers - in the contemporary construction industry, just as happens today. The inner group of twelve disciples included at least four fishermen and the wider circle in both Judea and the Galil would have featured plain, ordinary men from every-day walks of life: potters, weavers, agricultural workers, stone masons, shepherds and drovers. Matthew the tax collector is the only close disciple who would have had smooth hands; the wider circle may have included Zaccheus and Nicodemus. 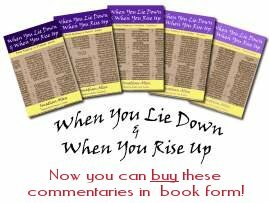 The rabbinic writings are full of rabbis who were tanners, blacksmiths and other vocations that required a very "hands-on" approach to life and living. In Pirkei Avot (The Ethics of the Fathers), Rabbi Eleazar ben Azariah said, "Where there is no flour, there is no Torah; where there is no Torah there is no flour" (m. Pirkei Avot 3:17), which is taken to mean that work and study must go hand in hand, both being essential to the maintenance of a home and the bringing-up of a family. The Song of Deborah - sung after Bark had defeated the king of the Caananites - lists the contributions made to the campaign by the various tribes that were involved. After Ephraim and Benajmin, Zebulun is listed as "wielding the staff of office" (Judges 5:14, NASB) although the older King James version says "the pen of the writer", before the chiefs of Issachar who were with Deborah. Within the Jewish world, this has defined a symbiotic relationship between Zebulun - the provider of either warriors or scribes - and Issachar - a tribe traditionally seen as having many scholars - whereby Zebuun would financially support and militarily protect Issachar's studies and they would both share the merit of the study and learning. Very similar relationships are seen in the kingdom today where those who support missionaries and foreign workers in prayer or financially are deemed to be sharing the reward of those actually out in the field. On a daily basis, worked out in our congregations and assemblies, it is clear that some people provide financial resources; some people just seem to make money for the kingdom and whether large amounts or small, they channel the funds and materials that the congregation needs into the group either for local use or for sending out to support others. Some people, on the other hand, regardless of their financial state, provide labour and services: cleaning, cooking, secretarial, building, legal, book-keeping and accountancy - all of these are valid contributions to the work of the kingdom and are counted in equal proportion and value to financial and material gifts. Both are considered an acceptable offering before the L-rd, a sweet aroma that rises before Him. G-d's people need to hear His enabling and empowering call in these days: "Let him bring the L-rd's contribution ... Let him come and make". 1 - The jussive mood expresses pleading, insistence, imploring, self-encouragement, wishing, desiring, intention, commanding, purpose or consequence. It can be seen in both the Hebrew Scriptures: "Come, let us go up to the mountain of the L-RD, to the house of the G-d of Jacob, that He may teach us His ways and that we may walk in His paths" (Isaiah 2:3, ESV) and the Greek Scriptures: "Let's go over to Beit-Lechem and see this thing that has happened, that ADONAI has told us about" (Luke 2:15, CJB). 2 - The word has a wider range of meaning than just a worker with wood, it is the root of the English word 'technology' and is now thought to cover working both with wood and stone. It also signifies a degree of skill and precision, rather that just a manual worker or unskilled labourer; someone whose experience and knowledge qualifies them for a craftsman position rather than a day-worker. Application: Whether you are a financial giver or a skill/time giver, know that the L-rd is pleased with the contribution that you make. If you are short on finance, but have been afraid to contribute your time because you are fearful that others will sniff, hear what the L-rd says and make your contribution to please Him. 22Feb11 22:46 Batya: It is nice to see someone say that both financial and physical giving is needed and I believe not everyone will do both. It seems like if you do not do a lot of physical giving than you are looked down upon, at least in the circles around here it is like that. We are all called to be different parts of the body and if we realize that we will have a bigger impact on society. Instead many believers are trying to do what others are doing because they do not know who they are or they feel condemnation from others and are afraid to do what they are called to do. The end result is chaos,no harmony and no peace.